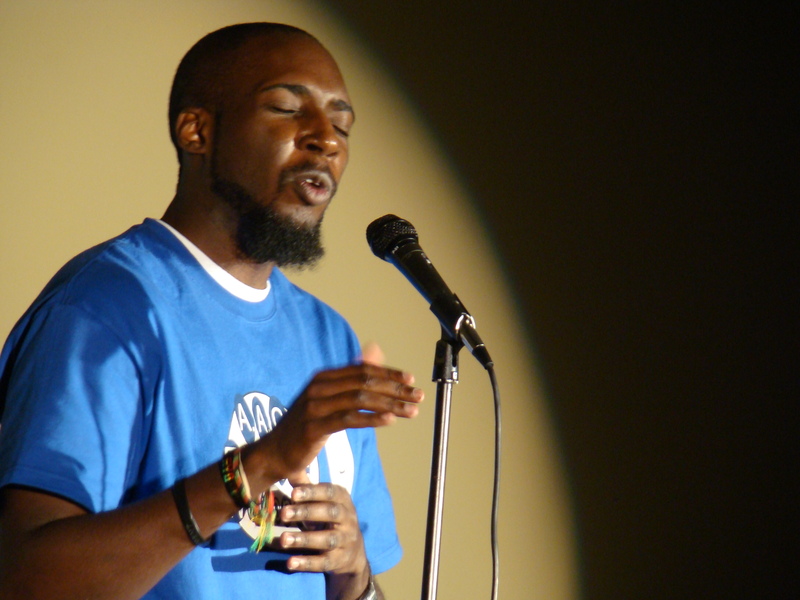 Paul Ayo gears up for a performance at JoLLE@UGA 2014 Spring Conference . The conference aims to reevaluate literacy and its centrality to justice and the transformation of teachers and students in the 21st century. In a effort to provide support to classroom teachers, and share, founder, Paul Ayo’s intense love of education, A.A.C. seeks classrooms for workshops. Paul Ayo, the founder of Art as an Agent for Change has been sharing his love for poetry with his students and community for the past seven years and he wants to visit your classroom and share his enthusiasm and experience with your students. Writing this post in the third-person was challenging, and I often find that I have to distance myself from my work to remain objective. With that said and the formalities thrown aside, I want to have a blast with your students. I enjoy teaching and I want to make the world my classroom. If you’ve got a space in your lesson plan for a poetry workshop with Paul Ayo, I’d love to fill it. I founded A.A.C. as a way to cut through the formalities that often get in the way of education. I like to teach through relevant representation and active engagement, and I have found that Art is the perfect method to engage all your students’ senses. Let’s talk! Booking a workshop is really simple. We can get started today. Members of A.A.C.’s D.N.S.T.P. chapter pose for a photo with students from Baldwin County High School’s Youth Poetry Collective–Team Spit Dat at the Baldwin County Literacy Fair. Contestants of A.A.C.’s first community dance competition, “So You Think You Can Dance — Milledgeville,” practice their group dance at Georgia College’s Wellness and Recreation Center this weekend for our Saturday, March 9, show. 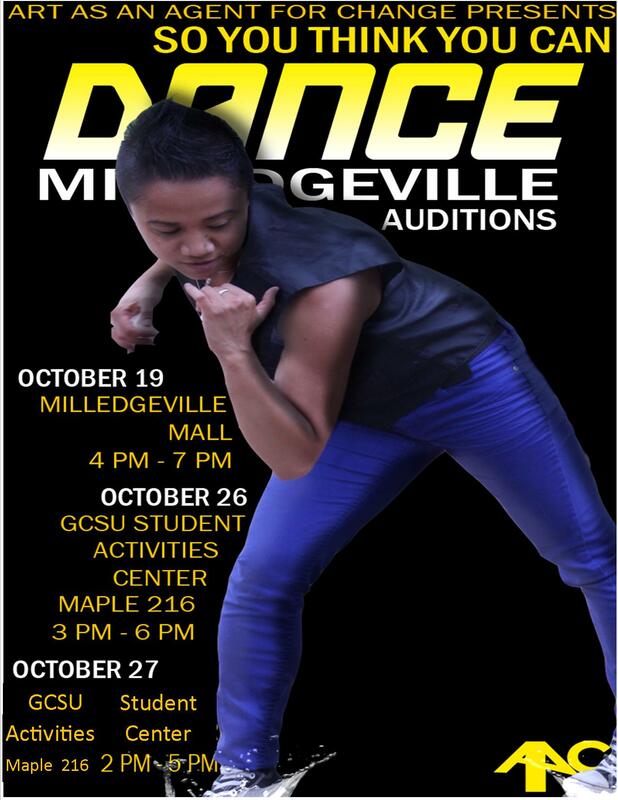 Stay tuned to learn more details about the event and each dancer. 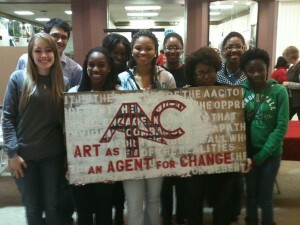 Support Art as an Agent for Change this holiday season when you search the Web or shop online with GoodSearch. GoodSearch is a remarkable search engine that turns your internet searches into donations for A.A.C. All you have to do is click the GoodSearch logo above, choose A.A.C., and start searching. Do good this holiday season. Once a year A.A.C. 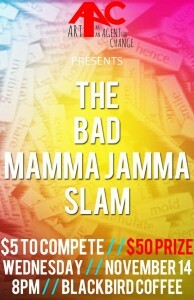 presents ordinary mortals the opportunity to be crowned the Baddest Mamma Jamma. The slam opens with a hilarious Haiku Deathmatch featuring Deandre “My Neck My Back” Beck VS. Thomas “Huggy Bear” Hughey. The deathmatch is followed by a furious Poetry Slam featuring spit flyin’, simile swingin’ poets from Middle Ga.
After a few scheduling conflicts we’ve finally got this one nailed down. Our audition dates for SYTYCD are as follows. Our Walter B. Audition Date had to be changed due to the Oconee Regional Fair. Tips and Truths with A.A.C. Here are eight poetry writing tips for your personal enrichment, followed by a random truth also for your personal enrichment. Cary Grant: Classic Hollywood actor. Arsenic and Old Lace. Eyes that gaze deep into your soul. And the subject of this week’s random truth! Tip 1: To get started, pick a specific moment and write about how it felt, or write about an object that is special to you, like a piece of jewelry or a card. Whatever you pick, just be sure its something that gives you a lot to say. Tip 2: Use deliberate lineation- How short or long a poem is creates a certain atmosphere, and the length of each line affects this as well. Use shorter lines if you want to focus on specific words, and longer lines to explain the particular moment or object you’re talking about. Tip 3: If you are writing a form poem, such as a sonnet, makes sure the subject matter fits the form of the poem so it doesn’t feel forced. For instance, to use the sonnet example, use that form to describe a specific moment or person that changed you in some way, whether its how you thought about something or your view of the world. This makes sense for a sonnet because the first part describes the situation, then the second part has a twist, and the third part tells what happened or changed as a result of the twist. Tip 4: After you write your poem, read over it to make sure everything in it is there for a reason. Poems have limited space, so economy of language is important. You may want to do this a day or two after you write the poem so you can see it with fresh eyes. Tip 5: Write as much poetry as you can, and save it. You have heard it a million times, but its worth repeating: The more you write, the better you will get, and the more you will understand how to convey what you’re saying. Also, saving your poetry will help you see the progress you have made. Tip 6: Read lots of poetry. Doing this can give you ideas for future poems as well as show you how to effectively use figurative language and symbolism. Tip 7: Show people you trust your poetry. The best way to tell if a poem works is to read it out loud to someone you trust, like a teacher, family member, or friend. He or she can tell you what works and what doesn’t, though for the best advice, go to someone you know who writes or teaches poetry. Tip 8: Have fun! Experiment with different forms and subjects and enjoy what you learn from that. 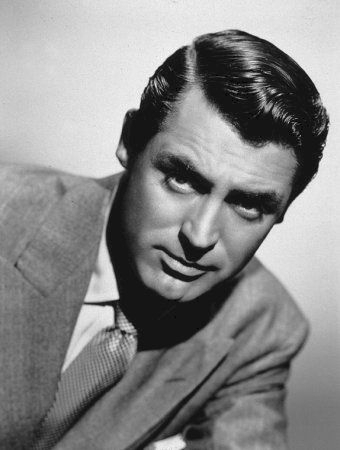 Random Truth of the Week: Actor Cary Grant’s real name is Archie Leach. BlogComments Off on Tips and Truths with A.A.C. A.A.C. proudly presents, The Lab, monthly poetry workshops at Blackbird Coffee in Milledgeville, GA. Our first workshop is Wednesday, September 5 at 8:30pm. Dust off that old notebook and grab your favorite pen. Conversations about poetry stimulate the best poems. Also, great coffee and great people make poetry even better. 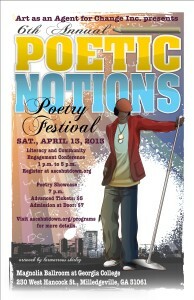 This workshop is for poets of all skill levels and backgrounds. Our focus during the workshops will build compelling poetry and compelling presentations for your poems both written and performed. Check your fears at the door, bring an open mind, and get ready to write some poetry in The Lab.